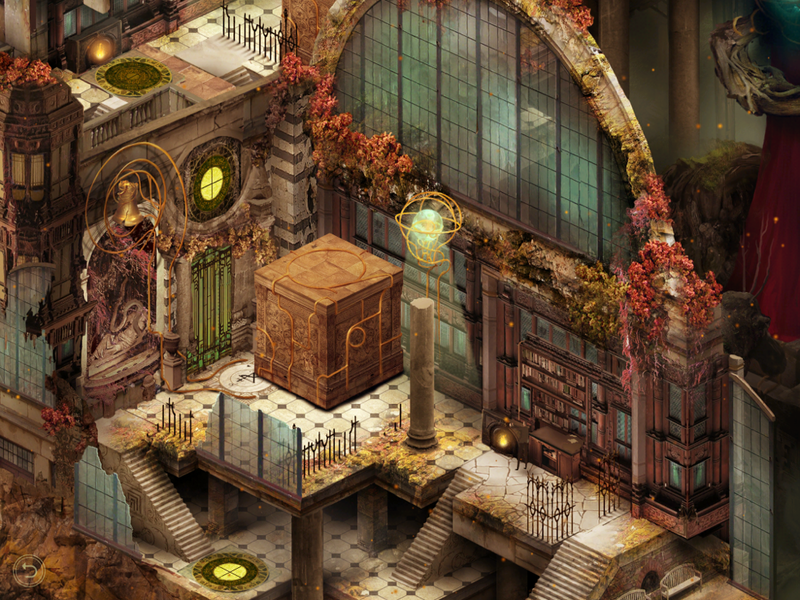 Visiontrick Media’s Pavilion combines two things I love — puzzles and gorgeous, surreal artwork. On paper, everything looks great and should be an easy game to recommend. And it still is, but with some reservations. There’s a lot that Pavilion gets right. It’s just as atmospheric as you would expect, from the art to the music to the animations and sound effects. Even the puzzles are often interesting. But there are some control issues that, coupled with timed puzzles, could break the relaxing experience you’d expect from something like this. I would still highly recommend it, but be warned that it does have its frustrations. 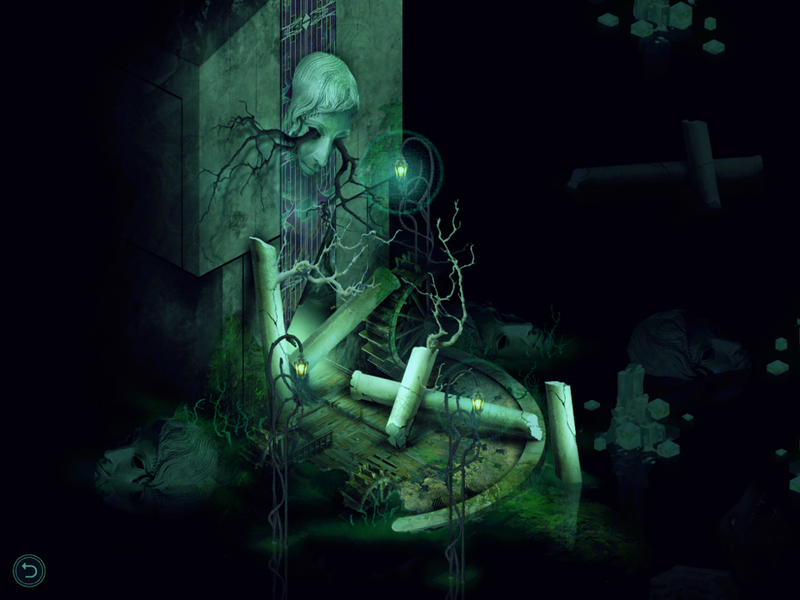 The game is advertised as a fourth-person puzzle adventure. And while that might sound a bit pretentious, it makes sense. Because unlike most point-and-click adventure games, you don’t directly control the character. Instead, you manipulate the environment to try to get him to go where you want. Early on, this is as simple as ringing a bell so he runs to it, and turning lights on and off. Since he’s afraid of the dark, you can turn a light off to try and direct him elsewhere. Later on, you’ll get cubes that you can push around to block his way, make him climb on them, or even force him to go a certain direction. There are glowing crystals, boats and elevators. There’s a nice amount of variety with the puzzles, and they’re very different than what I’ve seen in other games, though some do get a bit repetitive. The puzzles that felt the most satisfying for me were ones that involved some creative thinking, like on the boat, where you need to latch on to a second boat and find a way to get the two of them around different platforms so you can access them each from different areas. There were some really solid puzzles that made me work my brain. And for the most part, the controls work great. But some puzzles were endlessly frustrating, even after solving them three or four times. There are a few things that cause frustration in the game. First off, there are timed puzzles. These usually involve ringing a bell to get your little suited man to run to a floor panel and activate it. It will glow and start counting down using visual cues. You might then need to get him to run to a different floor panel. The door will then open, but it will close if either of the floor panels count down to zero. Since you’re not directly controlling him but only ringing bells in the right order, this timed aspect can get old fast. Especially when you’re dealing with three or four bells. The cubes are another source of anxiety, as dragging them can be a bit awkward sometimes. I try to pull one way and it goes another direction. Perhaps giving the cubes a little less freedom would help, so they’re going more on a track and less freeform. It’s not a huge problem, but could cost you some time having to correct the mistake. So when you’re dealing with those dreadful timed puzzles and they involve a cube, I wouldn’t blame you for giving up. It’s often hard to tell what exactly will make your character take the path you’re trying to get him on, so some of these puzzles can take numerous attempts to get right. You can see why I mean in my video review below. The game is also only the first chapter, with the second chapter still in development and hopefully coming soon. The good news is that unlike waiting six months to a year after the PC release like we did for the first chapter, the developer said the second chapter should come shortly after. So we won’t have to wait long while the PC players enjoy it. It doesn’t bother me so much that this is only the first chapter, as I’ve played plenty of games that way. The problem is that some things feel unfinished even for this chapter. Besides a few bugs I encountered, the game starts off giving you the idea that exploration will be rewarded. If you do certain things differently, you can follow side paths and go through doors that are off the main path and pick up story items there. Early on, it seems like this will be a big part of the game. I wanted to see what else I could find, so I took extra time to explore. But any side paths I found led nowhere, without giving me any sign whether I was doing something wrong or there was just nothing to find. One was tricky to access and seemed to be leading somewhere special, but then bugged out and nothing else happened. I asked the developer and he said some of them have achievements on PC (but not on iOS) or just aren’t finished yet. Considering some of these side non-quests do involve some work to access, it’s a really bizarre move to leave them in without any closure of some sort. And around halfway through the game you’ll stop seeing them altogether, giving the impression that the developers either ran out of time or just didn’t think through the whole plan. Whatever the case may be, leaving it like this created some distrust in the game. Any time I was stuck for a while, I wondered if it was bugged or something I missed because I stopped exploring. I wasn’t sure I could trust the game to be working as intended. Luckily, I got through most of the rest of the game without any bugs, but those hanging threads did taint the experience somewhat. It’s really a shame, as there’s so much to love about this game. But something should have been done to let players know when they’re on a path that leads nowhere so they don’t waste their time wondering if they missed something. It’s also very disappointing that there’s no iCloud sync. Pavilion is a game that I wouldn’t want to play entirely on my iPhone when I have a nice big iPad available, but I would love to be able to continue on my iPhone when I’m away from home. Or even just to show it off to a friend. Since you can revisit any levels after you complete them, iCloud seems like a no-brainer. It’s not a game you complete and start over from scratch, so it would be great to have it on both devices and just be able to play any level whenever I want. It’s also a large game, so having to keep it on my device to save my progress means it’s taking up precious space I could use for new games. As I mentioned, there were also some bugs. I managed to get past all of them either by restarting the scene or rebooting the game, but it dampens the experience. The game also doesn’t save mid-level so if you get stuck, you have to replay parts you completed when you come back to try again. But most levels are fairly short, so this is only an issue during certain ones. Still, it might be frustrating early on when you’re still getting the hang of things. I may be coming off more negative than positive, but there really is a lot to like about this game. The story is wordless and vague and unfinished, so I can’t really talk about that much. I am curious what happened to the woman (his wife?) and whether this is all a dream. He gets transported to an apartment sometimes, and it seems to be showing their relationship. I’ll leave that up to you to interpret. But I absolutely adore the artwork, music and overall atmosphere. I even liked most of the puzzles. Some were unnecessarily frustrating, but I liked the game enough to push through those to see the whole thing. The breathtaking visuals and soundtrack are worth the entry fee on their own. There are some things that hold this game back from being a true masterpiece, but I would still highly recommend it to any puzzle or adventure fans. Frustrations aside, it’s a unique and enjoyable game that had me constantly snapping screenshots out of awe. And I can’t wait to see what they have in store for the second chapter. 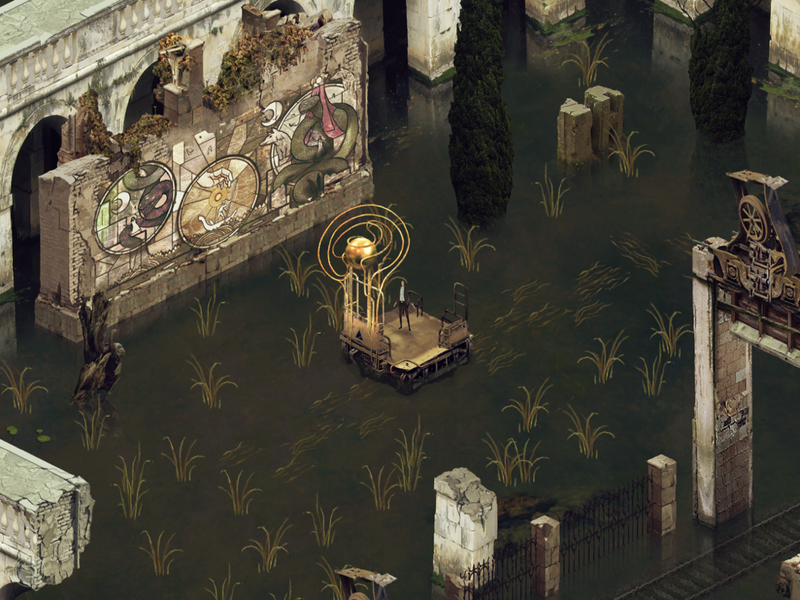 If you’re willing forgive the game its flaws in order to enjoy all the good stuff, you can download Pavilion here. And if you’re already playing the game and need help, try my walkthrough guide.